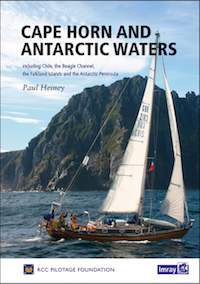 Written by author and broadcaster Paul Heiney, this stylish handbook from the RCC Pilotage Foundation covers the spectacular cruising grounds around Cape Horn, including Chile, the Beagle Channel, the Falkland Islands and the Antarctic Peninsula. Including some of the most dangerous waters in the world, from the treacherous Cape Horn to the icebound anchorages of Antarctica, it offers not only inspiration and encouragement but enough detail to plan the voyage of a lifetime. For more information and to buy a copy click here.